Think of how many words and how much space it would take a pundit, op-ed/editorial writer or blogger explain this cartoon. Some people are mocking Israeli Prime Minister Binyamin Netanyahu's use of this picture in his recent United Nations General Assembly speech, but I think that using a visual aid was the right thing to do. Remember that for most of the world, English is not the native tongue and listening to translations and not totally familiar languages is a strain. It's much too easy to tune out. By bringing out this picture, which has few words and easy to comprehend numbers, more people can follow what Netanyahu is saying. As an experienced remedial teacher, I applaud Netanyahu's use of this technique. And it makes me wonder if one of the reasons that the media and international leaders and diplomats haven't condemned Iran's Mahmoud Ahmadinejad vicious, threatening United Nations General Assembly speech be that they were bored to death and had tuned out? Ahmadinejad, who has called for the destruction of Israel stated that the Israeli government was a "fake government" responsible for the "genocide" of the Palestinian people. Ahmadinejad did not mention Israel's unilateral peace moves such as leaving Gaza and the terror rockets fired from Gaza at Israeli towns and cities. "The continued threat by the uncivilized Zionists to resort to military action against our great nation is a clear example of this bitter reality," said Ahmadinejad, who in the past has denied the Holocaust and just days earlier called for the "elimination" of Israel. Ahmadinejad stated that despite all efforts to achieve happiness - capitalism and consumerism by the US, the UK, France, Germany and Japan was responsible for both droughts and floods. He stated that the present global, democratic leadership represented an oppressive international world order, words that Hitler once used. That this "wrong management of the world was working for the devil" - colonialism founded on materialism and capitalism. How many people listened and how many cared about what he said? How much does this speech differ with his other ones? One excellent commentator on the subject is Arlene Kushner, and I highly recommend reading her article about those two United Nations speeches plus the Obama's. Kushner's analysis is excellent, and considering that today is the Eve of the Holiday of Succot, and I have much too much to do at home, I'll leave you in Arlene's very capable hands. One of the recent Latma skits, a Caroline Glick project, centers on the distorted "numbers" when the Israeli media is "reporting" on anti-government protests. When low numbers are hard to hide to to the viewers they keep claiming that "many" have attended. "Many" can mean almost any number. Ruthie Blum's latest article in Israel Hayom also mentions the reliability of stated facts. Yom Kippur was his week, so the Israeli media had a number of programs on the 1973 war in which Israel was caught by surprise. Our experts of the time were convinced that after our totally unexpected victory over Egypt, Syria and Jordan in 1967, the Arabs had learned their lesson and would never attack us again. The Leftist ideologue politicians were still waiting for the Arabs to agree to take most of the Land we had liberated in "exchange for peace." Every year more and more information is leaking out about the amount of security warnings that Israel had been getting about a military build-up against us prior to that 1973 Yom Kippur. It has been revealed that our politicians were more afraid of being chastised by foreign governments and the United Nations for countering with a "first strike" than the Arab armies attacking our unprepared and fasting soldiers. Here we are almost four decades later, and the curtains are up. Iran's President Mahmoud Ahmadinejad doesn't even have to keep his plans secret. The world doesn't care that his country is rapidly developing nuclear weapons and he plans on using them. Israel isn't his only target. Déjà vu, 1930's Germany, the world didn't care one iota that Hitler's Nazis were enforcing discriminatory policies against German Jews. And they still didn't care when he started arresting and killing them. European countries only woke up when the Nazi army invaded and took over. The fact that simultaneously millions of Jews were being murdered was not something the allies took into account when fighting the Germans. Last week there was a campaign for all Jews to pray at the same time for G-d to send the Moshiach, Messiah. That afternoon a young women who was traveling with me on a bus tried to tell me about it. I told her that it wouldn't help. "The Moshiach is here a lot. He could be here right now. The problem isn't that G-d hasn't sent him. the problem is with us, with people. We keep rejecting him. We have to be ready and accept G-d's orders and follow them." Simple Solution to Daylight Saving Time's "Long Yom Kippur"
Last night as my neighbor was driving me home from work I decided to "make conversation" by first telling him how much I had enjoyed the dovening prayers in our shul and then he mentioned that Yom Kippur would be "longer" next year. Hmmm... how could it be longer? Yom Kippur is always twenty-five hours plus a couple of minutes of fasting from the time we finish the meal until we manage to get that first drink of water. Ever since Israel adopted Daylight Savings for the summer months, there have been bitter fights between the religious and secular populations about the dates it should start and end. I must admit that I'm not a great fan of Daylight Savings Time, ever since I'd been a young mother struggling to get my "primitive" (following the sunlight) children to bed according to the distorted clock. My married daughter, now the mother young children, says that she'd prefer it in the winter to give more sunlight in the afternoon. My neighbor admitted that he doesn't care all that much about the "longer Yom Kipper" and thinks that there are more important issues to stand strong against the secular. It took me a second to finally realize what was meant by the "longer Yom Kippur." It's davka the same thing I have against going to the faster very early, "neitz" Yom Kippur service which is very popular among some of my friends. To those who so happily reported how early they finished dovening and how quickly the dovening went I kept asking why they wanted a longer day with nothing to do and nothing to eat. I'm very happy to spend my Yom Kippur day in the synagogue listening to the prayers and praying along. The couple of hours we had as a break between Musaf and Mincha were enough for me. I don't take naps, even Shabbat afternoon. If I sleep during the day, I can't fall asleep at night. "Just start the morning prayers an hour later, the time it would be if there wasn't daylight savings, and you'll have the same shorter Yom Kippur." The biggest problem will be remembering in time to suggest it to our synagogue committee and make sure they implement it. Pirkei Avot, Ethics of the Fathers instructs us to learn from everyone, so I must admit that the seed to this post, the idea to call the United Nations, European , the United States and numerous international aid organizations and mistaken "idealistic" Leftist do-gooders "enablers" came from reading Harlan Coben's recent book "Shelter." I don't know Coben's politics and hope that he doesn't have fits to discover that I'm crediting him with the idea for this post, since he used it in a totally different context. What's an enabler? It's someone, or in our context it could be an individual, or a family, a group, ideology, country or organization, that, although possibly unintentionally, encourages and/or makes possible the continuation of negative, dangerous, abusive, deadly or addictive behavior. Every time somebody says they can understand the Arabs' "frustration" aka terrorism, they are acting as enablers. They are making excuses for terrorist attacks, whether it be against individuals or nations. I would expand this to Israeli "centrists" like Prime Minister Binyamin Netanyahu who believes that by improving the Arabs' financial situation, raising their standard of living, they will reject terrorism. "We must weave an economic peace alongside a political process," Netanyahu said. "That means that we have to strengthen the moderate parts of the Palestinian economy by handing rapid growth in those area, rapid economic growth that gives a stake for peace for the ordinary Palestinians." The basis of this philosophy/ideology is that it's poverty that is a legitimate and understandable cause of terrorist activity. Creating excuses for terrorism justifies it, encourages it. The truth about Arab terrorist leaders is that they usually come from the upper classes, the most educated. Poor people are too busy trying to earn a living and are more pragmatic. I see the Arab customers in Sha'ar Binyamin shopping in Rami Levy and Yafiz. They are of the lower and middle class financially and educationally. The upper-class can afford to shop in the fancy stores of Ramalla or go to Europe, Dubai, Kuwait and the United States. For example, the "PA Finance Minister," sic, recently asked for aid to take over and develop land under Israel's control. Minister of Finance Nabeel Kassis asked the Ad-Hoc Liaison Committee (AHLC) meeting New York on Sunday to help the Palestinian Authority to reclaim area C of the West Bank, which is under full Israeli control. If they do this the Ad-Hoc Liaison Committee (AHLC) is enabling the terrorists to defy international agreements and endanger Israel. The division of the Land in Judea and Samaria was part of the 1993 Oslo Accords. Admittedly, I totally oppose that agreement, because in the long run it's dangerous for the security and viability of the State of Israel. Israel has suffered from Arab terrorism since before the State was even established in 1948, which obviously predates the 1967 Six Days War which resulted in the liberation by Israel of the Golan Heights (from Syria,) the Sinai (from Egypt,) the Jordan Valley, Judea, Samaria and eastern Jerusalem (all from Jordan.) During the nineteen 19 years that Jordan controlled those areas there was a population drain from all sectors. Jordan did nothing to develop those areas. Since June, 1967, under Israeli rule, the areas have thrived and Arabs do whatever they can to move there. 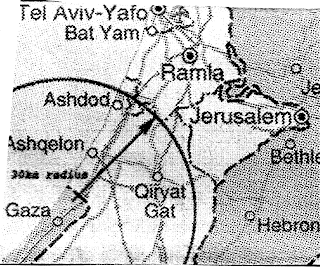 Immediately after the war Israeli Jews could safely travel all over Judea, Samaria, Golan etc. The local Arabs accepted their military defeat. It was only when the Israeli Leftist politicians, "thinkers," media and various international bodies encouraged the idea that Israeli rule was just temporary that the Arabs began to rebel against it and terrorize Jews. With every "peace agreement" our security lessened. So simply put, Appease aka Peace Now, their international supporters and all of those supporting Arab rule here are terrorist enablers. When Obama was campaigning four years ago, it was pretty easy for him to blame all of America's problems on Republican President Bush, claiming that he'll make everything better for America if elected. After three and a half years in office, Obama still manages to blame others for America's problems. Now he's claiming that U.S. Ambassador Chris Stevens' death wasn't his foreign policies' fault. He blames the anti-Islam movie and intolerance, even though evidence shows a much more complex cause. Here in Israel we're already home from a full day at the synagogue after Yom Kippur and have already eaten. The words and tunes of the prayers are still ringing in my head. The prayers revolve around the Vidu'i, a systematic confessions of sins. It's a very long list and we repeat it quite a few times throughout the day. Now, you may wonder why we need to confess so many sins. Are we really such awful people, always sinning? The emphasis by making the word "we" bold is the hint. Our confessions are in the plural. We are praying as a group, a people a nation, the Jewish People/Nation. G-d treats us as a group, even though we are individuals. We can't say "reward me, because I'm good and perfect. The others are guilty, but I'm not." We're all in this together. It's forbidden to throw the blame on others. Modern psychology teaches that the only person we can change is ourself. To make others better, we must make ourselves better. No, that doesn't mean that we should accept bad behavior from others. We have to make it clear that we don't accept it. We must be firm, strong and not be "enablers," providing others with excuses for their bad behavior aka sinning in the theological sense.
] A common theme of enabling in this latter sense is that third parties take responsibility, blame, or make accommodations for a person's harmful conduct (often with the best of intentions, or from fear or insecurity which inhibits action). The practical effect is that the person himself or herself does not have to do so, and is shielded from awareness of the harm it may do, and the need or pressure to change. By confessing in the plural we make it clear that we're all dependent on each other. We can't blame others. We must work together. Yes, of course Barack Hussein Obama isn't Jewish. I didn't say he was. I just think that his general attitude is dangerous. Why Do Leftists Think We Can Live in Peace With Those Who Want Us Dead? I wasn't going to post again before Yom Kippur, but Ruthie Blum's article shouldn't wait. Google search may not like that I'm just quoting, but I don't have the time right now to do more. Ruthie compares the guy who jumped into the tiger habitat in the Bronx Zoo to Obama. ...Less clear to all concerned was the behavior of Villalobos, who certainly should have known better than to leap into an enclosure with a carnivorous predator. When asked why he had behaved in such a suicidal manner — not to mention break the law and put zoo keepers in peril — he responded happily that he had “wanted to be at one with the tiger” and had gotten his wish to pet the huge cat. ...Ahmadinejad should not be allowed into this country. He should not be welcome at the U.N. He should not be presented with “options on the table.” There should be only one option for him and that is defeat. The Jews of New York in particular, though by no means exclusively, voted for Barack Obama in 2008. A majority of them will repeat that act of insanity come this November. It is an act no less insane than that of Villalobos, who wanted to be “at one” with an animal bent on his destruction. Obama’s policies, that involve wanting to be “at one” with the forces of the world bent on America’s and Israel’s destruction, are no less dangerous for American Jews than hopping head first into a tiger’s lair. I think the best comparison would be to compare that guy to the Israeli Left that keeps insisting that if we offer the right magic potion, Land etc, to the Arabs they will agree to live in peace with us. In Blum's book about Jimmy Carter, To Hell in a Handbasket: Carter, Obama, and the "Arab Spring," she shows that Carter thought the same about the Iranians, that if he could just be nice enough, they'd come around and release the American hostages. Let's pray that world leaders, including the media get true wisdom! Could This be The Secret Behind Barack Hussein Obama? I had been planning a very "Yom Kippur" article for today, since the fast begins tonight. This is the special time of the year we're supposed to be doing our cheshbon nefesh, accounting of the soul, trying to delve into our lives, do a spiritual "Passover cleaning." But a friend sent me a link to an article I just can't ignore. Many times I've written that United States President Barack Hussein Obama must have been chosen as a "cast director's dream." He's tall and can follow directions. I feel that he was groomed and chosen for the Presidency. Height is important, since statistics show that the taller candidate generally wins. He's half-black but speaks like a Caucasian, because he was raised by his white mother and her family. Lots has been written and produced on "film" about the "holes" in his story, including his place of birth. There are many good questions about his academic past, because although he was editor of the Law Review, no articles he wrote have ever been released. There are many more questions, legitimate ones. The key question concerns "who has been backing him?" Who is behind the training, the "casting" of Barack Hussein Obama? A friend just sent me this article which sheds from very strong light on the subject. Does 1979 newspaper column shed light on 2008 campaign story? The Vernon Jarrett syndicated column of Nov. 6, 1979, that appeared in the St. Petersburg Evening Independent. It originally appeared in the Chicago Tribune on Nov. 2. This image was pieced together from screen shots of the St. Petersburg Independent page available for viewing in the Google Newspaper Archive. Jarrett was the father-in-law of Valerie Jarrett, President Obama's closest adviser. “Yes...” Pahlavi hesitated, not yet getting the connection. I highly recommend you buy and read Blum's book. I read Ruthie Blum's To Hell in a Handbasket over the weekend. She's such a great writer that she made this very serious must-read modern history book read as quickly as a Michael Connelly adventure. I just wish it was fiction, because it isn't a very pleasant story. Those are the words that kept on echoing in my mind as I read her book. So Too much of Barack Hussein Obama's presidency and political ideology echoes Jimmy Carter, one of the very worst presidents in the history of the United States of America. Very few American Presidents have felt a true affinity to the State of Israel. Jimmy Carter's hatred and antipathy have become more and more prominent over the years, especially as he rewrites history in his memoirs, crediting himself and maligning Israeli Prime Minister Menachem Begin. Blum's book isn't about Carter/Obama and Israel. To Hell in a Handbasket: Carter, Obama, and the "Arab Spring" is about Jimmy Carter's disastrous presidency and his policy concerning Iran and the frightening similarities with Barack Hussein Obama. Too many people like to forget that Obama's American diplomats who had been stationed in Iran during Khomeini’s takeover were held captive for over a year. Not to blame the victim, but she proves that the victims' employer, the United States Government, led by Jimmy Carter, was guilty of total and utter incompetence. State Department employees, including the marines as security guards must take orders from their bosses in far-away Washington DC. While Israeli diplomats, who had also been under serious threat, managed to safely flee Iran, the Americans consistently misread the situation and just kept on getting into hotter and hotter water, "Hell" for sure. Blum chronicles how Carter was more concerned about his reelection campaign than the American State Department's 52 staff members whose lives were in constant danger as they were held hostage by Ayatollah Khomeini's terrorist government in Iran for 444 days. Just like Barack Hussein Obama recently cheered on the rioters in Arab countries as if they were a refreshing spring flower of democracy, Carter accepted Khomeini as the people's will against America's loyal ally the Shah of Iran. "Well, our media's posture--like our foreign policy-- is to shun any government that wants our friendship, and to placate and pursue our enemies." That is a message we Israelis and American Jewry must internalize, like a frequently repeated mantra. In terms of classic Jewish learning, it's the simple pshat, and Ruthie Blum's book is the drash, the detailed and very deep, factual explanation. Blum's book should be required for all diplomats, politicians, journalists, historians and academics, whether professionals or blogger pundits. Blum should also be invited as speaker to all sorts of groups and events for groups.. 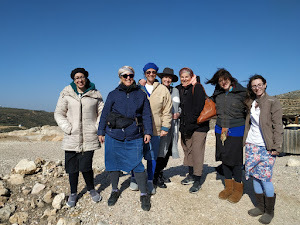 This Succot there will be activities at Shiloh HaKeduma, Ancient Shiloh, at Tel Shiloh. For those who can't read Hebrew and can't find the relevant numbers, a trick I'd teach my remedial students when confronted with a difficult unseen, aka reading comprehension article, Tues-Thurs Oct. 2-4, 9am-5pm. Instead of panicking when seeing all sorts of foreign shapes and incomprehensible gibberish, one should look for internationally used symbols like numbers. Here in this attractive poster, you can see 2-4-10, which means the 2nd to the 4th of the tenth month which is October. And the time is from 9-17, meaning 9am until 5pm. There's also a phone number, 02-9944019, and an internet site, www.telshilo.org.il And hints about the activities can be seen in the numerous pictures illustrating it. There's also one of those funny little squiggles that can be "read" by smart phones, if I'm not mistaken. No doubt there will be guided tours, street theater and workshops. There's a coffee shop kiosk that sells souvenirs and artwork by local artisans. Our holiday events have been very successful which is why it's being produced again this year. Shiloh is only about a half an hour from the Yarkon Junction, near Petach Tikvah and a half hour from Jerusalem. If I get more information I'll let you know. The recent Latma is even more brilliant than usual. I'm sure you'll like the skit about the terminology washing machine which creates useful euphemisms. And not for the first time they show how far removed from reality the American Government is, especially with Barack Hussein Obama as President. Ruthie Blum's latest article in Israel Hayom calls the American Republican Party to get their priorities straight and stop attacking Mitt Romney. 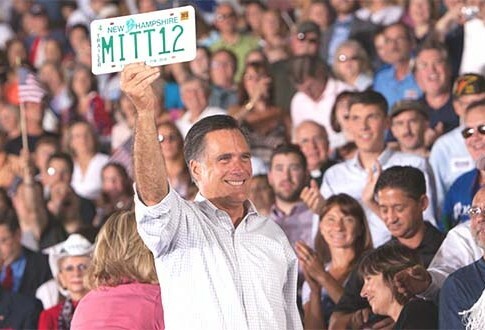 “There are 47 percent of the people who will vote for the president no matter what,” Romney answered. “All right, there are 47% who are with him, who are dependent upon government, who believe that they are victims, who believe the government has a responsibility to care for them, who believe that they are entitled to health care, to food, to housing, to you-name-it. That that's an entitlement. And the government should give it to them. And they will vote for this president no matter what … These are people who pay no income tax … [M]y job is not to worry about those people. I'll never convince them they should take personal responsibility and care for their lives." ... It is the job of the Obama campaign to attack the competition, and grasp at any and all straws to prevent Romney from achieving an electoral victory on Nov. 6. Less understandable was the response of many Republican pundits to Romney’s words. IMHO one of the reasons McCain did so poorly in the previous elections was the lukewarm support he had from many Republican bigwigs. Romney has a chance if the Republican team gives full support. Unfortunately the Republicans are learning the wrong things from Israel. Israelis are notorious for showing more sympathy for our enemies than fellow Israeli Jews. There were Israeli animal rights groups that condemned the Gush Katif DP's, those Jews who had been forcibly expelled from their homes and communities, for abandoning their pets, as if the hotels many had been housed in would accept dogs and cats. Israeli Leftist politicians and academics never miss a chance to criticize Israeli policy and government when traveling abroad, even when on official missions. One thing Prime Minister Menachem Begin was very strict about was to defend the Israeli Government even during trips abroad even when in the Opposition, even when he totally disagreed with policy. He understood that in a democracy, sometimes you lose, and when you lose you have to accept it. He understood that whether right or wrong, the government was still the elected government. Begin functioned as opposition when at home. As one of the founders and fighters for the establishment of the State of Israel, he understood that it was important to present a united front to the world which expected the country to collapse within a very short time. Re:American Elections- Do I Have a Right to Voice/Blog My Opinion? As an American expatriate who has never voted in American elections, do I have a right to voice or blog an opinion? Some people may say that the best way of giving an opinion is actually voting, but I'm not going that route, sorry. To do it I'd need an American address and in all honesty I don't have one. My parents have sold their New York home and live in Arizona. The issue that has been in the news recently about Mitt Romney is his "gaffe" about the problems for Israel if there would be a Palestinian sic state. Republican candidate for the United States Presidency told the truth about the goal of the so-called "Palestinians." Why should that be considered a "gaffe?" It's refreshing and encouraging that Romney sees the world through accurate lenses, unlike most politicians including Israeli Prime Minister Binyamin Netanyahu who thinks that by bending the truth he is a more acceptable leader. He may be more accepted by the extreme Left Israeli media, but he's not a leader if he follows their lead. Why is this statement by Romney considered a "gaffe?" I hope that he stands by it. Now if Romney stands by his very un-pc, aka not politically correct statement it will show guts, the kind of guts the United States and the world need from an American President. But if Romney starts hemming and hawing and diluting it, then he'd be proving himself no more than any other weak politician. Unfortunately, most politicians running for office are really chasing polls, trying to manufacture campaign platforms to conform to popular opinion polls. That makes them followers, not leaders. That means that they don't have the guts to do what's right. Their aim is to get elected at any cost. This is an international problem. The world is being run by the media, those savvy enough to control the minds of people, yes, very big brother. 1984 was over thirty years ago, but the book Nineteen Eighty-Four is brilliant. Unfortunately, we're living it now. Is there a world leader to rescue us? There are two extremes in how to handle "insults," and they are both wrong. We Jews, especially Israelis, have skin thicker than elephant hides when it comes to insults, personal, political etc. We rarely react, and when we do, it's with a totally ineffective wimpiness. Take as an example, the fact that here we are in the sixty-fifth (65th) year of the existence of the State of Israel, and there may not be a single country in the world that recognizes our Capital City as Jerusalem. All of these other countries locate their embassies to Israel in other cities. Some even have the added chutzpah to state that Jerusalem is the capital of the non-existent Palestine sic. Can you imagine if the world did that to any other country, or if Israel would retaliate by locating its embassies in cities of its choice in every single country that insults us? The other countries would definitely protest strongly, and the State of Israel could save a lot of money by choosing less expensive real estate for its embassies and staff residences. Israel should also call home Ambassadors from countries that support the foreign anarchists who come to support the Arab terrorists plaguing us. We should be demanding apologies from Turkey for the flotilla and other anti-Israel aggressions. Be the first to condemn and you're ahead of the game. Never apologize for what we haven't done. The recent international Muslim riots are just exercises in violence, something that they do periodically at any excuse, like Ruthie Blum writes. The ostensible cause of this continuing carnage — including yesterday’s suicide bombing in Afghanistan that killed at least a dozen employees of an American aviation firm working for the U.S. government — was a YouTube clip portraying the Prophet Muhammad as a sexual deviant. All evidence suggests that the Libyan attacks that spurred on the rest of the region were carefully planned in advance, without regard to the third-rate film that had been around for a long time before anyone picked up on it. This, however, has not prevented the Obama administration and the Clinton State Department from perpetuating the myth that the mass anti-American frenzy is due to “provocation” on the part of the Los Angeles-based pornographic filmmaker. Nor has it lessened Washington’s apologetic stance in relation to the poor Muslims who were offended by the short movie — nor altered the way the media have been reporting on the daily abominations. There are also some good points in Lady-light's blogpost. Simply put, Islam is showing itself to be a lousy religion, a lousy culture with lousy values. And our president is deferring to it. I know who I'm not voting for this coming November. Even Aish.com has an article about the dangers of Muslim violence. Aish usually sticks to Jewish religious topics. There's an enormous difference between Muslim riots and Jewish protests. I suggest that those of you who can please attend AFSI's upcoming demonstration. Israel Needs a Strong Right Opposition Not a Bloated Cabinet! 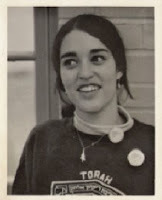 They wanted former Bnai Akiva members to vote nostalgia aka NRP or Jewish Home. Labor Party also has campaigned on nostalgia hoping the children, grandchildren and even great-grandchildren of former loyalists will vote for them. Other parties campaign for or against religion, the chareidi and extreme Left parties. Kadima has even pledged to offer a "supermarket" of ideologies. Recently, in order to renew the Old National Religious Party aka NRP aka Jewish Home, they've opened themselves up and have an active campaign primaries with all sorts of media and internet savvy wannabes. One of the most surprising is a secular Rightist, Ayelet Shaked. I've read a few interviews with her and at first was very confused. In terms of ideology, she seems more suited to the Ichud Le'umi, National Union, but then I noticed that she dreams of a cabinet portfolio. AS: I think I’d like to be either Education Minister or Foreign Minister since both education and hasbara are close to my heart. That's the criteria most people ignore. Does the political party aim to be in the cabinet at any ideological cost or do they want to be the magnet pulling the Prime Minister to what they think Israel should be? Ever since Menachem Begin's Likud put together the ruling coalition in 1977, there hasn't been a strong Right opposition. The NRP is not a truly Right party; it's a coalition partner, willing to ignore and compromise in order to hold onto its portfolio and perks. The Likud is a Center party supported by Right voters. The Left has a very strong opposition. That's how it keeps pulling the Likud leftward. We need a very strong Right opposition in Israel. That's why, although I know it's far from perfect, I will continue to support the National Union. I wish that some of those charismatic NRP wannabes could understand that if they really want to make a difference in Israel they should try to strengthen the National Union instead of getting mired in the NRP. Remember that cabinet posts come with lots of strings. Wily politicians like Prime Minister Binyamin Netanyahu don't offer anything without those well-tied strings. If a minister tries to step out of line, he or she finds them like a noose on the neck. If an Israeli wants to lead on the political scene, he or she is best best off staying in the opposition until powerful enough to be Prime Minister. I'm a Torah observant Jew. In the United States and Canada I'd be called strictly Orthodox. In Israel I'm considered דתי לאומי dati le'umi, national religious, meaning that not only do I keep/observe the "standard" Torah commandments/mitzvot, I see my living in the Jewish Land, especially a place like where I live, Shiloh, to be observing the mitzvah, G-d given commandment to yishuv ha'Aretz, settle the Land. Growing up in the American suburb of Long Island in the 1960's I considered the greatest hypocrites to be the "armchair liberals," those who claimed to believe in certain ideals, like desegregation but told others to send their kids to those schools, and made every effort to keep their kids away in a "good" school. 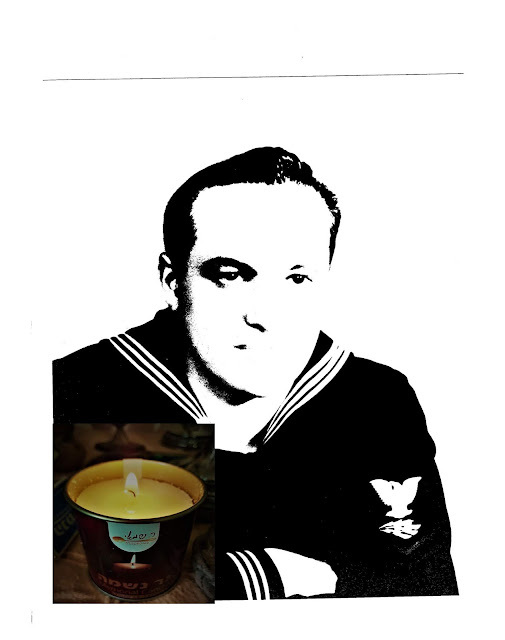 The 1967 Six Days War happened at a very critical age for me. Only a couple of years before I had taken on Torah observance and just a few months before it I had been introduced to Zionism. Those of you who heard the blasts of the shofar, ritual ram's horn on Rosh haShannah may have had been moved the way I had been. Shofar blowing is a very difficult skill, and the shofar can been uncooperative. That's what happened today in our local synagogue. Suddenly the shofar refused to cooperate with the very experienced, competent and G-d-fearing neighbor who had been entrusted with the role of shofar blower. There were many false starts, unplanned silence, and there were also some fantastic soul-shaking sounds that came out. As he struggled and we patiently listened my mind went into some unexpected places. First of all, I kept hearing myself saying in my mind how glad I am not to be a man. I'd hate that sort of community responsibility. I also have no desire to have to study to read the Torah for the congregations or lead the prayers. I have enough to do. It's not just the "women's work" of cooking and organizing the home. There are many couples who split those jobs, and in some cases, the men take on the more traditional women's roles. I would never give up my children, the pregnancies, nursing and raising them. That's the role I had always wanted, and men are physically incapable of pregnancy. And as my neighbor struggled to make the shofar cooperate, I thought of those women/couples who had dreamt of children and for whatever reasons, G-d didn't give them children. As my neighbor blew into the shofar and nothing came out, I thought of those couples who suffer serious infertility. Their empty homes are silent like that shofar. Not only are there couples struggling to have children, there are many people struggling to find the right ones to marry. It's not a simple situation. Just like it takes more than just blowing into a shofar to get the right sounds out, dating isn't always enough to find the right marriage partner. There are things that just aren't in our control. And we have to make the best of it. I think I got the best "shaking up of the soul" from this year's blowing of the shofar than any other year, even though it may have seemed unsuccessful in the classic sense. We learn more from difficulties than anything else. Sorry, but this will be quick, since I have little time. I'd like your responses, so please comment and share. This past Shabbat at the table there was a rare argument between me and a guest, with whom I usually agree. 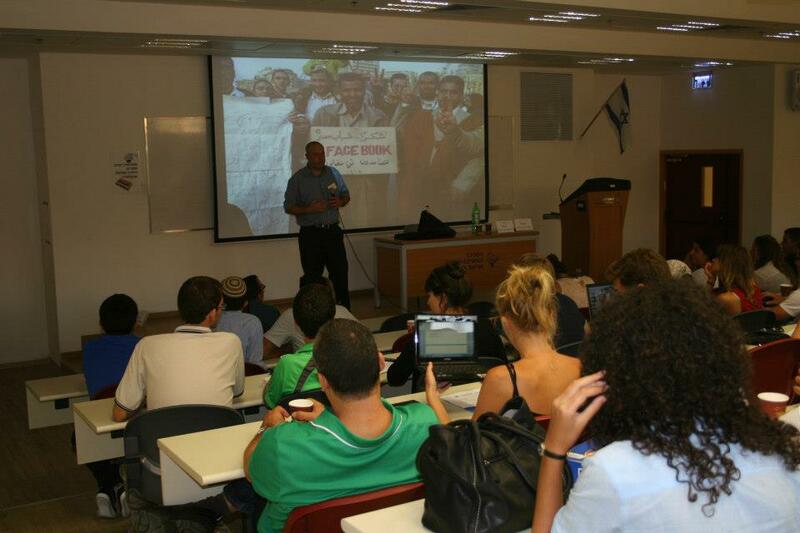 He didn't think that the converts of the IDF convert courses should be accepted. He stated that there should be a "trial" time to see if they stick to the life of Torah and Mitzvot after the army. I consider the gerei tzeddek, righteous converts of the courses offered during service in the IDF, Israeli army to be on a very high level. It's not that simple for them to get into the courses, they have to show a real interested in living as Jews, following mitzvot etc. The soldiers in these courses are generally youth who have grown up or were born in Israel but aren't Jewish. By serving in the army, they are showing a additional commitment to the Jewish Land and State of Israel that many born Jews never dare to do. They not only enjoy the benefits of living in Israel, but they are willing to risk their lives for the continued existence of the State and for our security. That IMHO puts them on the very highest Jewish Level. For that reason, I feel their conversions should be 100% accepted. Judaism is a religion of action, commitment, not just theory. That is the problem with those who claim that it's enough (or even superior) to just sit and learn Torah. I'm sorry if I've offended anyone, but there is no real justification in that life style. In the Torah G-d instructs all tribes to defend the Land, even those not living here. ...Then we have to recall the immortal words of the NeTZiV in his commentary to Moshe Rabeinu's question to the members of the tribes of Reuven and Gad when they looked to avoid going to war as the nation stood on the banks of the Jordan River: "Your brothers will go to war but you will remain here?!" he asked. This, explains the NeTZIV, would have constituted an "avlah", an unjust wrongful act that would be perpetrated against all of Israel (Ha'amek Davar, Bamidbar 32:6). Rabbi Chaim Wasserman, my NCSY rabbi. I'm quoting this which he sent to Torah Tidbits, but I didn't ask his opinion about IDF converts. There is not supposed to be a specific fighting sect/group in Judaism. The responsibility is on all of us. The fact that many Jews refuse to fight to defend the Land, state and People is a great problem. It's even worse that many Jews stay abroad or encourage others to use the yeshiva deferment to stay out of the army. That's why I consider those who are willing to fight and defend our People, Land and state to be on a very high Jewish level. You can't say that their time in the army isolates the students in the conversion course from temptation and also say that being in the army is religiously difficult for Torah-observant Jews. May we unite into one fighting People. It's up to us to fight for our Land! Shannah Tovah! May G-d give us strength and determination, physical and spiritual! 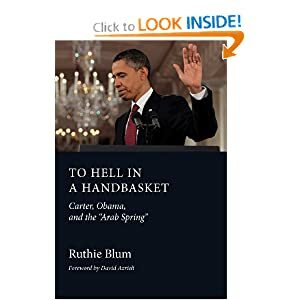 I've been reading Ruthie Blum's fantastic book To Hell in a Handbasket: Carter, Obama, and the ‘Arab Spring. It's a must read for sure. By reading what Ruthie Blum has discovered in her well-researched book, you can see why the United States is seriously under attack all over the world. United States President Barack Hussein Obama, his Secretary of State Hillary Clinton and their staff of advisers have learned nothing from Jimmy Carter's mistakes. The problems, dangers and killings are increasing like yeast dough on a hot day. Are Americans wise enough to understand that there are inherent flaws in the philosophy their government religiously follows? Caroline Glick has also written about America's faulty foreign policy. They let the genie out of the bottle and and it's violently taking over. She also wrote The 9/11 attacks on the US embassies were not about a movie. This week's Latma, brought to you by Caroline Glick, has a totally brilliant piece of a "professor" discussing "post-logic" which gave me the idea for the title. This week is Rosh Hashannah, the Jewish New Year. G-d willing, we'll be blessed with wise and brave leaders. Leftist media, politicians, ideologues led by the Obama-Clinton government lauded the riots that heralded what they dubbed "Arab spring," but the truth is that the demonstrators rioters were not innocent, well-meaning human and civil rights activists. They were dangerous, violent anarchists and worse. The citizens of those Arab countries are not enjoying new freedoms and western-style democracies. It shouldn't surprise anyone who actually paid attention; life is hell, yes, even more hellish than before. Egypt, which had been a strong ally of the United States now isn't thanks to the Muslim Brotherhood and Morsi as well describe in this Tablet article. This should not have come as a surprise to Prime Minister Benjamin Netanyahu, who is used to being snubbed by the administration of President Barack Obama. Nor did anyone else – least of all the regime in Tehran – fail to note that Clinton’s dismissal of “deadlines” and “red lines” was aimed directly at Israel. United States President Barack Hussein Obama and his Secretary of State Hillary (still wannabe president?) Clinton are still refusing to admit that sweet-talking aka "negotiating" with the Iranians is the worst way to stop their nuclear weapons program. They are fixated on 1950's failed child psychology methods. Hillary Clinton actually admits that she hasn't a clue but refuses to take responsibility and admit personal failure. That single line is the most damning indictment of Hillary Clinton’s State Department that could ever be penned. It demonstrates her complete lack of knowledge about the region, her failure to anticipate security threats, and worst of all, her willful ignorance about the Islamists that she and President Obama trusted to take over Libya and Egypt. The United States Embassy in Yemen was attacked and how did the Americans react? How can people still refer to the United States of America as a world power? The United States is in trouble. Does the USA really want or need another four years of Barack Hussein Obama? The Turkish delegate: "My friends are shocked that I came to Israel." The Denmark delegate: "It's a rare opportunity - you can't just call the army and ask to be shown around." The hot Israeli sun brought warmth to the faces of the delegates who just got off the bus. They have arrived from all over the world including Denmark, Sweden, Turkey and Australia to take part in the New Media & Public Diplomacy Seminar at the Ariel University Center in the Shomron. Their formal goal is to "gain a better understanding, of how public diplomacy shapes the Middle East conflict," but they are also counting on having a lot of fun. "It is wonderful to be here again," said Turkish delegate Aga Beck. Although he had recently visited Israel two months ago, this was his first time over the 1967 green line. "I'm not shocked to be here, since I don't believe the news in Turkey" he said. But his friends from home see it differently: "My friends are shocked that I came to Israel, because they have really 'interesting' views concerning Israel." I met Diana Nujidaat, from the Galilee, at the entrance to the dormitories. She's in her last year of high school and dreams of becoming a member of the Israeli parliament. She has lived her entire life in Israel yet she's never been over the 1967 green line. "It's my first time here and I'm very excited to be here." Nujidaat hails from a Beduii tribe in Israel and explained that "It's an Israeli state, the majority is Jewish, and I accept that, but this is also my state." Magnos Frank, a delegate from Denmark, is very exited to have come to Israel. "I'm very glad to be here, and I'm looking forward to this seminar." The program’s field trips are of special interest to him as he pointed out that "it's a rare opportunity, you can't just call the army and ask to be shown around." The seminar is sponsored by The Communications School at the Ariel university center, and the Ministry of Public Diplomacy & Diaspora Affairs. It will take place throughout the coming week concluding on September 14th. During the program the delegates will meet with Israeli officials, reporters, professors and political activists such as the 'watch' women and settlers. The delegates will also travel in the West Bank and visit sensitive area in the Israeli-Palestinian conflict. Baruch Shomron is a communication/journalism student at the Ariel University Center. The High Price of Tomatoes-- Don't Blame It All on Bibi! For the past few weeks, there has been a choreographed campaign on the news blaming Prime Minister Binyamin Netanyahu for the rising prices of vegetables and other seasonal items. Yes, you sharp readers already got the clue, "seasonal." "They said that tomatoes don't grow in the winter, and I should tell you to make the salad out of cabbage." That was before the more expensive and less natural green/hot house agricultural industry. Israel is a small country and even by utilizing the warmer Jordan Valley, we can't have fresh and tasty summer fruits and vegetables all year long. According to many health experts, we shouldn't eat fruit and vegetables out of season, even if they are on sale at reasonable prices and even if they are grown naturally in a different location. Citrus and avocados are for winter, while peaches and grapes are for the summer. In the days when I ate felafel every few weeks, rather than one or two a year, I'd notice how the salad changed. In the summer it would be full of tomatoes and cucumbers while the winter salad was mostly cabbage. The leaves on my grape vines are drying and withering, as you can see on the two pictures I just took. Yes, I ran out to the merpeset-terrace armed with my camera just to show you. There are just a few grapes left to eat, and my grapes are late-ripening. We don't live in a tropical jungle with food to pick freely at our fingertips. Every single year at this, yes, pre-Holiday season the prices skyrocket. Summer produce is no longer fresh and plentiful, and the winter fruits and vegetables aren't yet ripe. Citrus will only be sweet, delicious and healthy after the first rains, in another month G-d willing. Agricultural scientists do their best to extend the seasons, and the agricultural businessmen import what they can. But remember that although we want to eat whatever we want when we want, there's a price to pay. And it's not the government's fault, no matter who is in power. There's one thing I learned pretty quickly living here in Israel. No matter what the weather, no matter how much rain, the farmers complain. The rain is either too early, too late, too little or too much. Our rain is the result of how G-d calculates our sins and mitzvot. So, if we want more plentiful and less expensive produce, we must live according to G-d's instructions, each and every one of us. G-d makes His calculations for the entire Jewish People together. In another few days it'll be Rosh Hashannah and then Yom Kippur. It's time for Teshuva, Repentance. Too bad we can't turn back the clock. The Iranian nuclear development should have had been stopped, bombed, destroyed a very, very long time ago. Today it is too big for a couple of fighter pilots to hit it like Israeli Prime Minister Menachem Begin did to the Iraqi Osirak Nuclear Reactor in 1981. Not only has the United States Obama Government labeled Iran's nuclear develop "Israel's problem," but that's the policy of Mitt Romney, too. Iran is a serious international problem! Why do United States President Barack Hussein Obama and his perky poodle Secretary of State Hillary Clinton refuse to state any teeth-like deadlines or conditions for the Iranians? QUESTION: On Iran, nuclear negotiations have ground to a halt despite increasing noises out of Israel* about a possible preemptive military strike. The EU is now talking about new sanctions. What’s the game-changer here? Does the U.S. need to state more explicit redlines to persuade Iran to take the deal that was offered and to reassure Israel to hold off from a military strike? SECRETARY CLINTON: Well, I think we’ve maintained a steady course of our two-pronged policy. We have always said every option was on the table, but we believe in the negotiation, the diplomatic effort through the P-5+1, but also pressure. And we are working to increase that pressure. The sanctions, we know, are having an effect. The efforts that the P-5+1 have made to pin Iran down on what exactly they are willing to do are still underway, and we will be having some meetings in the next month in New York and elsewhere to take stock of where we are. So I think it’s a very challenging effort to get them to move in a way that complies with their international obligations, but we believe that is still, by far, the best approach to take at this time. It's obvious that the Obama-Clinton government has been following, as she calls it, a "steady course," but it's the road to international hell and violence, not to any sort of peace. But then what can we expect when the US President doesn't bother attending official security briefings. Not only wasn't Obama properly prepared for a publicly made call on a modern cellphone, but he doesn't bother listening to his own official experts. Obviously he must be getting his "orders" from some other source, maybe whoever has been training and preparing the "sleeper" President for the past few decades. The world is in danger from both the Iranian nuclear development and the total incompetence of the free world's (United States, Europe, Israel etc) ineffective opposition to it. Ruthie Blum provides us with excellent information about the finances of the Pseudistinians aka Palestinians sic. The rest of us ought to pray that the request is denied. This is because, wherever such a bundle would be spent in the PA, not a penny of it would go to improving the lot of average Palestinians. On the contrary, it turns out that among the highest wage earners, other than the corrupt leaders and their cronies, are Palestinian prisoners incarcerated in Israeli prisons for minor crimes such as mass murder. In fact, such terrorists were placed on the official PA payroll in 2003, when a law was enacted granting anyone imprisoned for fighting against “the Israeli Occupation” a monthly salary based on the severity of the offense and length of time spent behind bars. The longer the term, the higher the salary, as was reported this week on Channel 2. Just over a year ago, in 2011, the PA raised these salaries by 300%. Since then, it has spent over $4 million per month on these “salaries,” and more than $6 million per month to families of suicide bombers. Not only that: a monthly fee is also paid to Israeli Arabs serving time for having committed acts of terrorism against Jews, or for having aided and abetted Palestinians who committed such acts. Is that what you want the United States Government to do with your tax dollars? Remember that the PA also invests in the missiles they fire at Israel. Three Grad-type rockets were fired from the Gaza Strip into southern Israel late Saturday and early Sunday, with one rocket scoring a direct hit on a home in Netivot, Army Radio reported Sunday. A man who was inside in the Netivot home was not hurt, but the structure, and several neighboring homes, sustained massive damage. Three people were hurt when they fell while running to a bomb shelter, and four more people were treated for shock. Two rockets were launched overnight, with one hitting Netivot and the other striking the Beersheba area. The second rocket has not yet been located. Early Sunday, a third rocket exploded within Gaza territory, but not before setting off the warning siren in Ashkelon. Damage to a home in Netivot caused by the direct hit of a Grad rocket on Saturday night. Simply put, money donated to the "PA" goes to their two pet projects, their leaders' pockets or for weapons and terrorits' payments to be used against Israel. And those so-called human rights groups that support the Palestinians are really anti-Israel fronts out to destroy Israel, like the ones supporting the case against Israel by Rachel Corrie's family. Just to remind you that Israel is a very small country. If you take that arrow and connect Netivot to Tel Aviv, you'll see that it's about another eleven kilometers as the crow flies. Tel Aviv is only about twenty kilometers from Gaza, which is less than fourteen miles. Jerusalem is a drop more. These Arab terrorists endanger the security and very existence of the State of Israel. They shouldn't be coddled and supported by world powers. Who Loves Israel More, Romney or Obama?